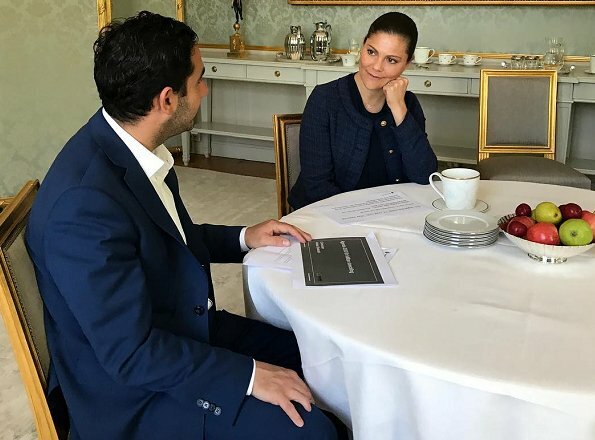 Crown Princess Victoria of Sweden met with Swedish Minister for Public Administration, Ardalan Shekarabi at Haga Royal Palace in Solna, Stockholm on Friday. This meeting wasn't at the Swedish royal court's calendar. Definitely this jacket looks better layered over a top of some sort than buttoned up in front, as in the previous photo. Victoria appears to be either listening intently, or bored. Can't decide which. Haha. Regardless, she looks great in blue. Jacket is better when open. Otherwise it needs to be a size bigger! In this jacket, she looks sporty, strong, but rlegant.it is obviuos that she is in nice physical condition and that her musculature is well toned.More she is so kind and sweat person, I like a lot her and hear beutiful familly. Love the skirt. Beautiful colour. Clearly the top is at least one size too small. Overall a balanced look, but somewhat left wanting.